Wisdom, a Laysan Albatross, is the world’s oldest known banded bird in the wild and breeds exclusively on Midway Atoll NWR. She was already an adult when banded in 1956. Like many other seabirds, Laysan Albatrosses delay sexual maturity until at least age 5 and may not breed successfully until ages 8 to 10. This means Wisdom was at least 65 years old in 2016! She has fledged at least eight chicks since 2006, and as many as 40 in her lifetime. 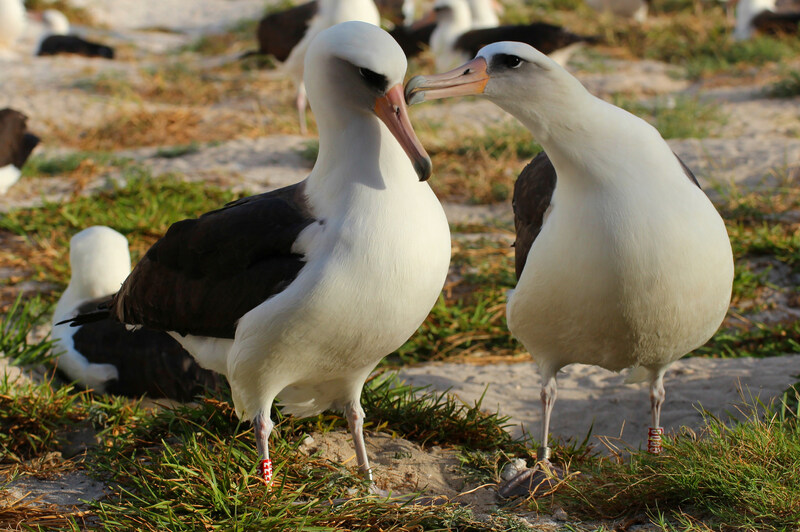 Wisdom was first observed back at Midway on November 19, 2015 with her mate Akeakamai (Hawaiian for “love of wisdom”). The pair followed the usual pattern for Laysan Albatrosses: after egg laying and a few days of incubation duty, her mate took over and Wisdom headed out to sea to feed. This second incubation shift, taken by the male, is typically the longest (2-3 weeks); females need a big energy boost after egg-laying. The pair continued to take turns during the two months it takes for the chick to hatch, with incubation shifts growing shorter as hatching time neared. Akeakamai was on duty for the last shift, which began January 20, 2016. Their chick was observed coming out of its shell on February 1st. Wisdom arrived on February 7th and Akeakamai took off soon after in search of food. 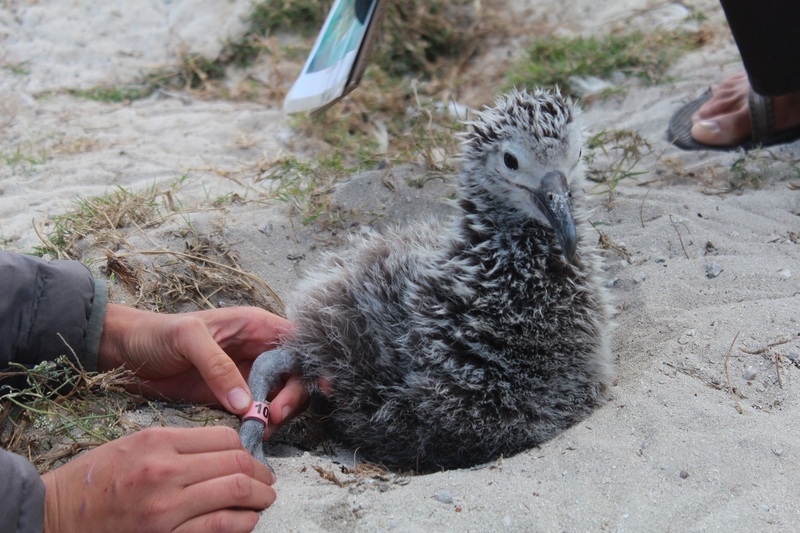 Their chick Kūkini, which means “messenger” in Hawaiian, now sports its own band so biologists can keep track of Wisdom’s offspring. 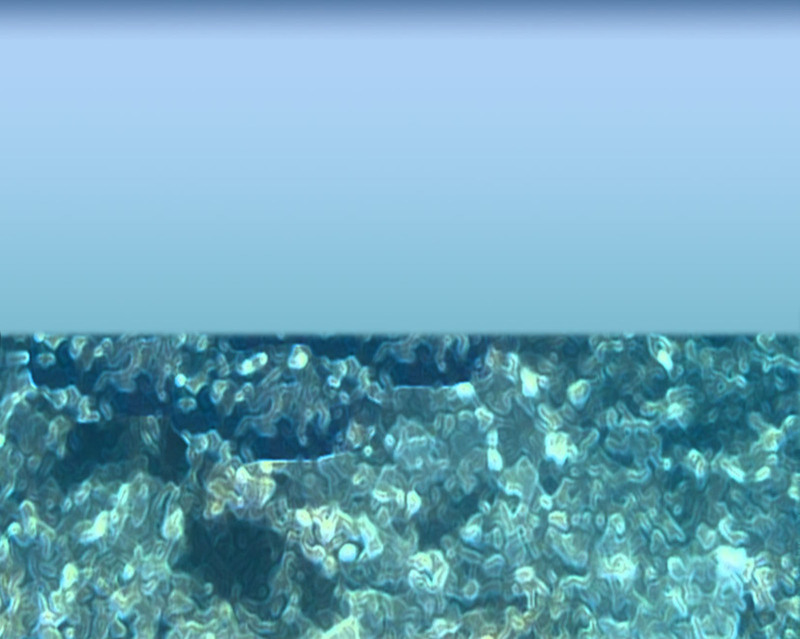 The press release also described Wisdom’s journeys over the ocean since she was first banded – likely covering over three million miles. “That is up to six trips from the Earth to the Moon and back again,” said Bruce Peterjohn, Chief of the Patuxent Wildlife Research Center’s National Bird Banding Laboratory. For more information about Wisdom and the latest updates, visit Wisdom’s official USFWS website here. Wildlife biologist Chandler Robbins first banded Wisdom when she was a breeding adult in 1956. Banding thousands of albatrosses on Midway was part of a multi-year study designed to reduce impacts of wildlife and aircraft collisions. Robbins returned in 2002 (as a young 82-year old) hoping to find and reband some of the old-timers; the old aluminum bands often fell off after about 20 years due to salt and seawater corrosion. 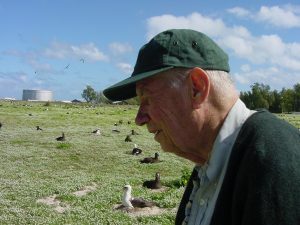 When he checked the bird-banding records at the USFWS Patuxent Wildlife Research Center, he struck gold; it had been 46 years since he and Wisdom first met on Midway. Robbins, who turned 98 on July 17, 2016, continues to give Wisdom a run for the money. He still shows up at Patuxent several days a week to work on a history of breeding bird atlases and other projects.